We specialize in producing precision, high quality parts at Mentco Inc. Our customers rely on us to custom-fabricate exceptional components with tight tolerances, and our capabilities are well exemplified in the project shown here. 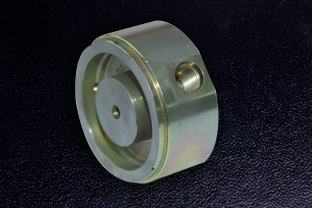 We were contracted to machine a stainless steel hydraulic cap for a client in the oil and gas industry. A full array of our machining techniques was employed, including rod cutting, CNC milling, and CNC turning. Using 303Stainless Steel, we flat milled, drilled, threaded, grooved, faced and bored the metal to our customers' exact specifications. We also used a number of secondary operations, including deburring, cleaning, and cadmium plating. 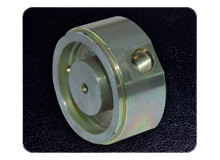 When completed, the hydraulic cap featured tolerances of ± 0.001". We used a high magnification microscope to inspect for holes and burrs. This job was completed in just 8 weeks plus transit time, with just-in-time (JIT) options available from our San Antonio warehouse. We now manufacture 7000 of these caps a year for our client in California. To learn more about this project, please see the photograph and table below, or contact us directly.